BAGUIO CITY – Israel Ambassador to the Philippines Rafael Harpaz underscored that Baguio city, as one of the premier tourist destinations in the country, must be frequented by his country’s citizens wanting to spend a vacation in the country thus he will initiate measures on significantly improving the travel from Israel to the Philippines and vice versa. Ambassador Harpaz, who paid a courtesy call to Mayor Mauricio G. Domogan Wednesday afternoon, pointed out the key factors in enticing foreigners to visit the Philippines include the availability of direct flights and visa-free entry to the said country, a matter he will work on to ensure more frequent visits of Israelis to the country. 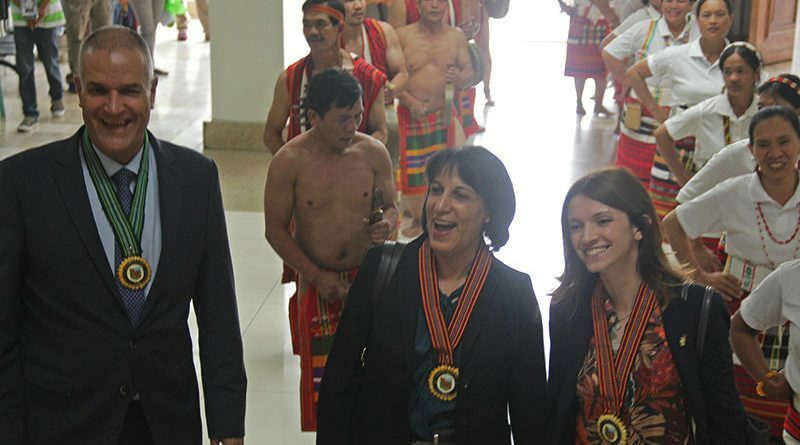 He recognized that the Philippines has numerous scenic spots to showcase like Baguio City, Palawan, Bohol, and other nature and scenic destinations, preferred by Israelis, thus, the need to ensure the smooth travel of foreigners from their country to the Philippines. ‘We will work out the availability of direct flights from Israel to the Philippines and vice versa so that Israelis will be enticed to consider the Philippines as part of their destination when going to a vacation in other countries in the world,” Ambassador Harpaz stressed. During his short visit stint in the city, the ambassador disclosed that Filipinos are friendly and caring thus Israeli employers prefer to have Filipinos caregivers with over 30,000 of them already there as overseas Filipino workers giving care for the elderly, persons with disabilities and children in the different parts of Israel. According to him, tourist destinations in the different parts of the archipelago are beautiful with unique sceneries which are suitable to the demand of Israeli tourists who want to tour around the world. The Israeli envoy revealed the flight from the Philippines to Israel is around 10 and a half hours with several stopovers thus it is important to have direct flights from the Philippines to Israel and vice versa to shorten the travel time enticing more Israelis to make the Philippines as one of their must-see destinations. Last year, he stated some 30,000 Israelis visited the country but the number needs to be increased to help in aggressively promoting the country’s tourism industry to the Israelites. He added many Filipinos are also frequenting Israel to visit the birth place of Jesus Christ and have a glimpse of the Promised Land but the absence of direct flights hinder the influx of visitors from both countries. The Israeli envoy is currently going around the country to personally witness the beauty of the tourist spots and feel the hospitality of the people which he will share to his compatriots to encourage them to visit the Philippines. Harpaz admitted he considers Baguio City as one of the beautiful places in the country because of its cool weather and beautiful sceneries which should be visited by foreigners. AMAZED AMBASSADOR – Israel Ambassador to the Philippines Rafael Harpaz, his wife Shulami, and Deputy Chief of Mission Yulia Rachinsky-Spivakov enjoy the warm reception from Baguio officials and employees. Photo by Bong Cayabyab.